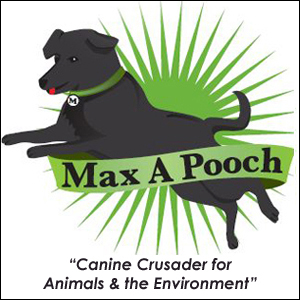 Recently Dahna Bender joined Keith Sanderson and Max A Pooch on Pet Life Radio where she was named an Awesome Animal Advocate! Click here to listen to the podcast. Pet Life Radio is the largest and #1 pet radio network on the planet, featuring weekly pet-related talk shows hosted by the most well-known pet experts, authors and radio and TV personalities in the world of animals and pets. With over six million monthly listeners Pet Life Radio has hosted celebrity guests like Jennifer Aniston, Owen Wilson, Betty White, Rachael Ray, Ryan O’Neal, and many more. Pet Life Radio just recently won a 2012 Genesis Award Honor (Humane Society of the United States), and is the official radio media sponsor of the 2013 and 2014 American Humane Association Hero Dog Awards. Christmas Carols Saving Little Puppies! Dahna was featured on Joonbug’s “Charity Social” blog in December 2013. 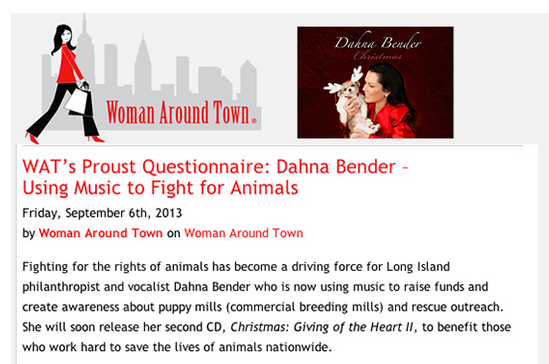 This wonderful write up discussed Dahna’s ‘Giving of the Heart’ CD and her advocacy of National Mill Dog Rescue. Click here to read it. In an exclusive interview for this Examiner article, Dahna Bender discussed why she performed this act of philanthropy. During the interview Bender said, “ The most important things to me are for me to perform acts of kindness and giving. My voice and music are ways I can accomplish this.” Read the full article here. In this interview with New York Smash, Dahna tells of her experience on her normal drive home when she spotted a protest at a pet store and pulled over. She learned that the protesters were there to defend animal rights and save dogs from puppy mills. “It was then that I decided to take action and somehow help,” Bender told New York Smash. Read the full article here. 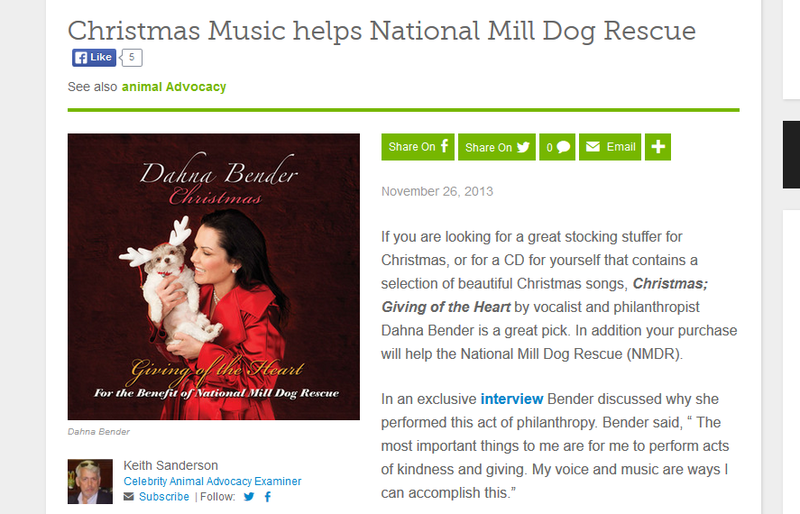 An article in the Press-Telegram Music section discusses Dahna’s motivation behind her ‘Giving of the Heart’ Christmas CD and her heartfelt dedication to National Mill Dog Rescue. Click here to read the full article. Dahna was featured in the December 2013 issue of Milieu Magazine as one of the magazine’s favorite people spreading inspirational cheer. 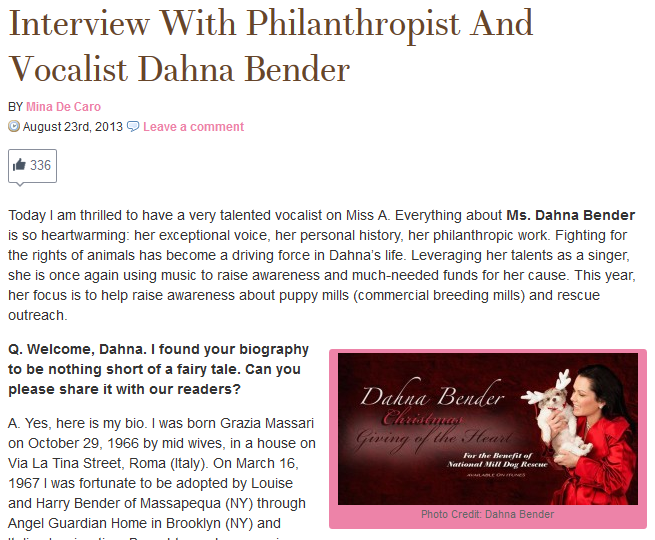 During this interview Dahna discusses why helping puppy mill breeding dogs is so dear to her heart. Click here to read the full article. In this article from Hallehs.com (Hallels is a shortcut for more Hallelujahs), Dahna talks about the organization, National Mill Dog Rescue, and their dedication to rescuing discarded puppy mill breeding dogs. She then goes on to promote her ‘Giving of the Heart’ Christmas CD, of which all profits will be donated to National Mill Dog Rescue. Click here to read the full article. In Dahna’s Halfstack Magazine article, Dahna discusses the legal horrors found inside puppy mills throughout the United States and her dedication to stopping this abuse through her music. Click here to read the full article. 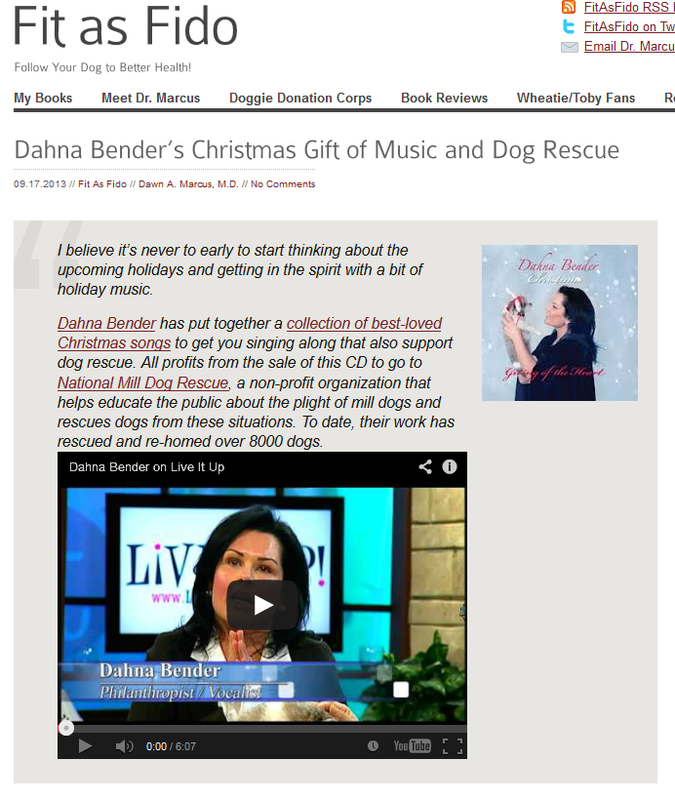 In this Fit as Fido article, the author promotes Dahna’s ‘Giving of the Heart’ Christmas CD and includes her video on Live It Up. For the full version, click here. This questionnaire from Woman around Town features Dahna and her advocacy efforts fighting for human dog breeding. Read it here. The authors of this wonderful article from Two Classy Chics praise the holiday season and Dahna’s ‘Giving of the Heart’ Christmas CD, along with her efforts behind it. All profits from the CD will be donated to National Mill Dog Rescue, furthering their efforts of saving discarded puppy mill breeding dogs from what would otherwise be a certain death. Read the full article here. 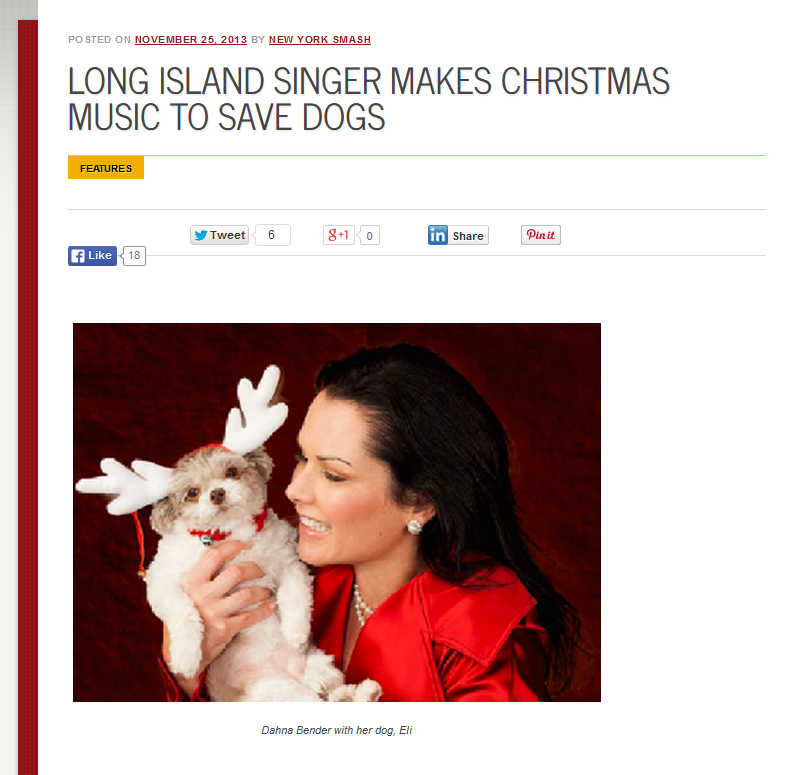 This Haystack Magazine article offers a sneak peak into Dahna’s upcoming project – a Christmas CD meant to save dogs. The profits from this CD will be donated to National Mill Dog Rescue, helping with their efforts to rescue discarded breeding dogs from puppy mills. Click here to read the full article. In this amazing Q & A with Miss A – Style Meets Charity, Dahna discusses her ongoing support of National Mill Dog Rescue and how she is turning her vocal talents into a fundraising tool. With the release of her ‘Giving of the Heart’ Christmas CD, Dahna will be donating all profits to support the organization and help save the lives of puppy mill breeding dogs. Click here to read the full article. 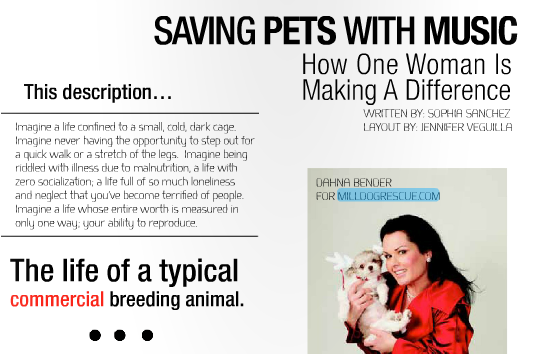 Life with Dogs covers the moving story of Dahna Bender, singer and philanthropist, and her efforts to save puppy mills breeding dogs and spread education about this important cause. 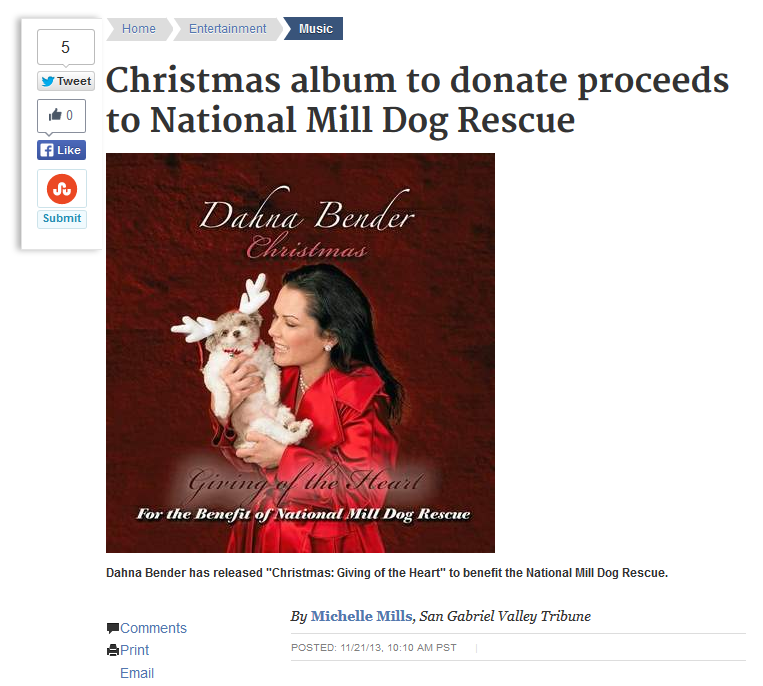 Her ‘Giving of the Heart’ Christmas CD will be sold nationwide with all profits going to National Mill Dog Rescue. Read the full article here.